This entry was posted on November 1, 2017 by Logs Direct. Specialist wood and charcoal supplier to the restaurant trade, launched their new product ‘Piccante’ at the European Pizza and Pasta Show in November 2017 set to be a ‘gigante’ in the pizza world. Logs Direct has already taken giant steps since it diversified four years ago from its core trade of supplying fuel for wood-burning stoves, to a position in which it now provides logs for pizza oven chefs. Now, it is launching an own-brand product with a quirky twist in the name, using the Italian word for hot in the culinary sense, rather than that referring to calorific heat. The ‘Piccante’ log is the result of Logs Direct listening to the feedback of pizzaioli, often gleaned when presenting pizza chefs with a very special ‘Woody’ Award – the only accolade for chefs who cook with wood. With an ever-increasing focus on food safety, and ever-present demand for wood that gets up to speed fast and delivers the best heat return for money spent, Logs Direct set itself a mission of creating the perfect eco-briquette. Piccante logs are environmentally friendly, food safe and HACCP and carbon tax compliant compressed virgin beech logs made in Italy. Specifically designed for use in the food sector, these natural logs are completely free of additives, glues and adhesives and create neither carcinogenic fumes, nor toxic ash. They produce heat superbly, with each eight-sided 1.55kg log having a calorific value of 5,35 kcal. They rest on the oven floor in a way that improves the air flow around the log, improving combustion and leading to a better burn. They also keep the oven cleaner. As a Piccante log is formed from ground and compressed virgin beech, it is a denser briquette than anything else in the market. This creates a lower flame, which ensures pizza bases are not singed or stained by the embers from the wood. Logs Direct has worked with a focus group of chefs during the testing phase for this product. 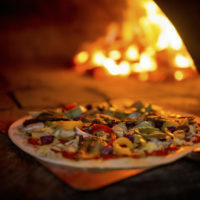 One – Chris Atkins of Gourmet Pizza in Oxfordshire – says: “It is clear that the moisture content of this briquette is extremely low. This has allowed us to achieve a stable burn and ensured that our pizzas are cooked consistently. The Piccante briquettes have also proved very easy to light and have reached optimum temperature quickly. Piccante logs come in nine-log, 14kg boxes, with each box costing £9.00. Whilst the market leader has a minimum order of a half palette of 24 cartons, Log Direct has no minimum order requirement. It can also supply these briquettes alongside its ready-to-burn kiln-dried wood, if chefs just wish to use the Piccante log to boost the fire, or get it started, and also has first-class restaurant-grade charcoal available for those eateries that have barbecues or char-grills. Piccante logs can be bought online at www.logsdirect.co.uk or by calling 01524 812476. The knowledgeable team are used to handling chefs’ queries and even have a great knack of knowing when a pizzaiolo might be about to run out of wood. Their ‘pizzeria prompt’ service has saved the day on many occasions!